Culture Making, the Christian Scholars Network and bookselling for the fun of it. Andy Crouch’s Culture Making website. Do I need to tell you that Andy was the speaker at this important gathering? Can I say again how much we love that book, Culture Making: Recoving Our Creative Calling (IVP; $20), how important I think it is, how good it would be for you or your group to take it up, to give theological meat to the bones of our natural inclination to be busy making much (or not so much) of the world. There is even a free study guide for download at Andy’s site. It has been widely discussed in various venues, pro and con, the website is a hoot to explore (keep visiting as they keep adding good stuff) and I still say it was one of the top two or three books of 2008. This event, though, was not just to promote the book and the audience was not cultural creatives, media folk, pop-culture fans or artists. They were teachers, informal intellectuals, Christian college professors, pastors, grad students and others who see investing in higher education as a worthy goal, a strategic goal, itself an example of important culture making. Patrons, supporters and those who are interested in the good work of Tom Grosh, who works with InterVarsity Christian Fellowship’s Faculty and Grad Student Ministry, gathered to hear Andy reflect on the ways in which this new central PA project—-a mission we’re calling the Christian Scholars Network— would be an example of the general themes he draws out in Culture Making. Culture-making by networking adult Christians in the academy? We work with students, care about campus culture, send campus workers like IVCF or CCO staff to minister to students in this great time of transition in their lives. What about the staff of colleges? Deans, teachers, assistants, researchers, counselors, student affairs staff? How do we come alongside them, encourage them, resource them, challange them? Is it hard for them to live out an natural Christian faith in the secular campus setting? And how about affirming the work of grad students and PhD candidates? IVCF has a national movement called “the emerging scholars network” which we think is also very important. Although our Hearts & Minds “vocations” annotated bibliography is basic and designed for beginners in the journey of developing a Christian perspective in various academic disciplines, fields and callings, it really is an important resource. I should have announced it at the Network event. I had the wonderful opportunity to make small talk with two significant scholars from two colleges here in the area, a philosopher and a scientist (not to mention an inner city teacher, an artist, a retired theologian, a student at Hershey Medical School.) We didn’t solve the worlds problems, let alone the problems of the academy (hee heee) but it was good to connect. And good to have Andy call us to intentional Christian integration, the effort to relate faith to learning, to be Biblically-informed and distinctive as scholars and teachers, administrations and serious students. Thank God for the grad students and workers, professors and pastors that attended and intended to be further involved in Tom’s ministry. He hopes to continue conversations about raising a respectable evangelical witness at places which are commonly known in these parts—Dickinson, F&M, Elizabethtown, York, HAAC, Millersville and the like. I made a plug for some books in my part in the program. As you might guess, I reminded them that we may not need to work so hard pushing what Marsden called “the outrageous idea of Christian scholarship” (a title of his book inspired by a critic in the New York Times who declared a Christian perspective in higher learning “outrageous”) if we started younger, explained the vision of faith & learning being integrated, used the language of vocation, calling, scholarship, and such, with our undergrads, so, for the formation of future Christian scholars I recommended The Outrageous Idea of Academic Faithfulness by Derek Melleby & Donald Opitz (Brazos; $14) as a gift for high school students who are college bound. Every youth pastor and anybody who works on campus should have a few of these to pass on to students who need help relating faith and higher learning. As Tom brought in Andy to inspire local scholars, I felt the need to remind folks of this handy little book which raises these questions in simple, fun ways for those who aren’t yet serious scholars, but are ordinary students. A natural follow up was another all time H&M favorite: Steve Garber’s Fabric of Faithfulness: Weaving Together Belief and Behavior (IVP; $17.) This is a grand book for a group of faculty or grad students to ponder. Steve wrote this on the heels of his work with CCO doing ministry with law & med students, and his time doing serious consulting with various church-related college administrators. It was a perfect title to recommend in that setting. What can be done to help young adults mature in faith in ways that are integrated, sustainable, faithful? Can the things they learn on campus make a difference, a real difference, in their lives as they unfold year by year? Fabric of Faithfulness documents (based on interviews with 30 & 40- somethings) how they maintained the radical Christian commitments that they learned in college to think vocationally and worldviewishly–relating Christ’s Kingship to all they do, in private and in public, in home and at work, in prayer and in politics–over the course of the ups and downs of life in the modern world. It is a bit rigorous reading for most 18 year olds, I’m afraid (even though Stan Hauerwas famously wrote he wished we could give one to every student going off to college) it surely is ideal for older students, grad students, teachers and administrators. How do we find people and principals and programs that can impact those in formative times in their lives? Can faculty be significant mentors to young adults? Can they really teach in a way that inspires Christian conviction? How does what we learn make a difference? Can a thoughtful and intellectually integrated faith last in the post-Christian climate of the new millenium? What a great choice for academics, or those who support their work, to read and ponder. 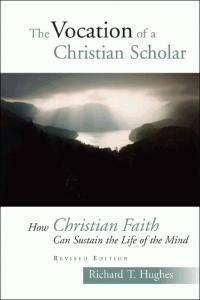 There are books on this project of “thinking Christianly” and we commended a few on the Christian mind. Messiah College’s Richard Hughes has a lovely, lovely book called The Vocation of the Christian Scholar which we really like. (Get a nice look at it here.) James Sire’s Discipleship of the Mind is very helpful as is the sequal, Habits of the Mind, on the calling of being a Christian intellectual. I believe that Parker Palmer’s little book To Know As We Are Known (subtitled “a spirituality of education”) is wonderful, to be reflected upon by teachers of all kinds. Brian Walsh & Richard Middleton’s must-read worldview book Transforming Vision has a few excellent and insightful chapters on the task of the Christian scholar and how to develop an awareness of creational norms for various disciplines and life areas. The appendix, written for undergrads, the “bibliography we can’t live without” is an asset for anyone serious about developing the Christian mind (did I note that we helped with that??) So I highlighted a couple of books and explained why what we do here at the bookstore might help faculty or others on campus. Christian scholars unite! Get the resources out! Spread the word that, outrageous or not, Christ calls us to be faithful in our work, which means thinking in new ways about the ideas that shape our work. I didn’t have a bull-horn, but I was sort of on my soapbox, if a mere book announcement can become a quickie homily. Of course, we mostly celebrated Andy’s work** among us that day in Elizabethtown, glad for non-denominational evangelicals, anabaptists, Episopalians, Presbyterians and all sorts of folks to unite around this cultural mandate which God so graciously gives in Genesis. We have the huge and uncontainable privelege of stewarding God world—from caring for the Earth to caring for families, caring for neighborhoods and caring about international trade, working in Godly buying habits and playing habits, thinking habits, work habits. To practice Christian discipleship all the live-long day, in the world but not of it, through God’s common grace for the common good—ahh, this is the calling of us all. Crouch is a help, a surprisingly interesting ally, in our awareness of how culture impacts us, and how we can impact culture, and, finally, how we can be more human and humane. (One of the earliest church fathers, you may recall, said the glory of Christ is a human who is fully alive!) For Christians interested in work like Tom’s “Christian Scholars Network” Culture Making is a great resource, inspiring and insightful. It was wonderful being a part of this launch, and I hope telling you about it might open horizons in your own mind. Who can you unite with? What sort of networks are needed in your profesional or vocational arena? Can Hearts & Minds somehow serve as a resource for your ongoing reading in being faithful in every zone of life, agents of cultural transformation and truly human social good. Can we help you make more of your life, your world? Let us know. **Here is a very interesting video interview; with Andy. I’m not sure the blond read the book, but Andy holds forth remarkably well. Check it out. A final great point: Andy in his wonderful presentation gave some good reasons why we should support Grosh’s “Christian Scholars Network” and why investing in the university, or those who work in college settings, is vital for Christian cultural faithfulness. Our forebears started colleges and universities but perhaps didn’t steward them well: some have fallen away from Christian faith, for better or for worse (Crouch suggested it is a very mixed bag and only to be lamented.) Yet, he insisted, in a highlight of his talk, that we need not go quickly to the strategy or talking point that “college faculty shape the next generation of gatekeepers” and to impact college students for Christ and reform the university we must also reach faculty with the gospel, since the ideas that are taught in colleges will soon trickle down to street level, shaping culture, often for ill. Yes, it is true that colleges may be influential settings for young people in transition, and yes, the ideas there grow legs and can be hugely influential. Yet Crouch made a spectacular argument that due to commercialization of learning, the consumerism of students and their parents—coupled with the way in which industry and the military pay for the most interesting research these days—the university may actually be declining in its often emphasized influence. It simply may not be as influential or strategic for shaping culture as it once was. Did you get that? The colleges and universities of our era may have reached their zenith of influence, may be in decline (in terms of societal influence) and yet we must support and invest in them, in the very elites that live and move and have their being in those hallowed ivy leagues. Why? Because some things are just good to do. Not because of utilty. Not because it pays off. Not because we “get” some ministry bang for our buck. The fine arts and the fine sciences, for instance, are not always obviously “for” anything. They are good to do. We should support those who live in such arcane arenas, and be glad that God may get glory for jobs well done. His proof text for this? Psalm 111:2 which reads, “Great are the works of the Lord, they are to be studied by all who delight in them.” An early scientist had it emblazed over his primitive lab. Perhaps it is something we should all emblazen all over this good world, over art studios and work benches, labs and libraries. Perhaps it is a motto for booksellers, too. Sometimes, it is just good to read stuff. Maybe the next time I try to convince customers to read Crouch or Garber, rather than lavish useful praise and suggest their significance, I’ll just say “Because.” Some things are just good to do. Take up and learn. Have fun. Praise God. So good to have you join us Byron! Planning has begun for a â€œCulture Making” discussion this summer in the Elizabethtown area. In addition, the next Christian Scholars Network gathering at Elizabethtown Brethren in Christ is ‘in motion.’ I’ll let you know when it’s on the calendar (along with any other events). Looking forward to these and other future opportunities to partner in ministry. Ned, You were there in spirit, well, at least Square Halo Books was there. And you’re name came up in conversation. Talked about at a Christian Scholars confab, pretty cool, huh, smart guy? AND: congrats about having a piece of your work appear in this week’s Comment. What a great journal to have your art shown. 1000 Words, yay.